VEP Students have been contributing to the VOICES Student Magazine since 2015. Please enjoy the latest edition, Fall 2018 by visiting the VEP website, Student tab or click here for all current and past issues. Thank you to Margaret Pearsall and Phil Friedman who provided staff & board editorial support over the last few years. In 2019, Phoenixville area resident and VEP student, Premisa Kerthi will take the lead in coordinating the magazine. Please send all submissions by email to: volunteer.english@volunteerenglish.org. We will forward your articles and suggestions. 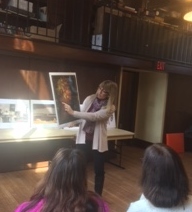 In 2018, students, tutors, and community members gathered to hear Martina Keogan’s “Speaking of Art” presentation at the VEP’s West Chester, Downingtown, Easttown, and Phoenixville Library Conversation Groups. Thank you for attending and supporting these special gatherings. Our tutor facilitators will continue their commitment to hosting weekly English as a new language conversation groups in collaboration with our library partners. For a complete listing of VEP’s 5 regional groups, click here. During the holidays and summer months, please check local library calendars as well for updates. Afternoon Edition 2.5.18 featured VEP Tutors in Training. Thanks to Marge Kuhn, Gary Moskovitz, and Ben Stetler for allowing us to “put faces” on such an important story. Here is the link to read all about it.